In May 2014, the National Institute of Standards and Technology (NIST) awarded an advanced manufacturing technology planning grant to a metalcasting project led by the American Foundry Society (AFS). The Pathway to Improved Metalcasting Manufacturing Technology and Processes - Taking Metal Casting Beyond 2020 project is one of 19 initiatives that was awarded a total of $9 million to develop technology roadmaps aimed at strengthening U.S. manufacturing and innovation performance across industries. Reach industry consensus on metalcasting capability gaps, solution priorities, and investment recommendations. Identify potentially transformative technologies requiring collaborative research. Establish clear problem definitions and a common framework for parallel work by multiple organizations. Chart a transition path to facilitate interoperability of developed solutions with existing systems. Build a collaborative infrastructure tailored to the roadmap's targeted outcomes. Initiate development of an infrastructure that supports an advanced U.S. metalcasting industry. 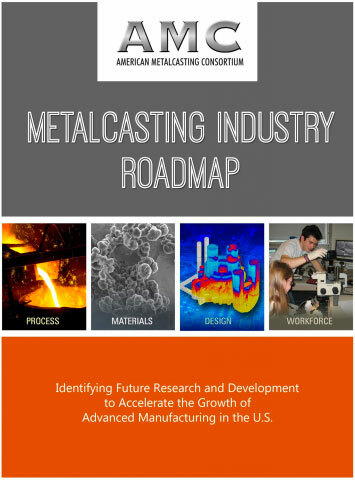 The new Metalcasting industry roadmap is available by clicking the above image. This roadmap identifies and ranks research and development goals, define workforce needs, and initiate other steps toward speeding technology development and transfer and improving manufacturing capabilities. Workforce development- to find ways to fill the shortage of production, skilled and professional people to serve in the steel casting industry.